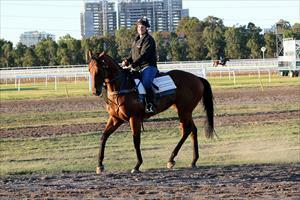 Two runners on the Lakeside course at Sandown on Wednesday for the team with Potemkin and Lakhoni. Potemkin is the first to go in race three, the Ladbrokes Back Yourself Handicap over 1400m where Jack Martin will ride and jumping from barrier nine. It is the second start this preparation for the four-year-old, which finished unplaced at Sale at his last start. Potemkin won over 1700m last preparation however, Mike Moroney has resisted the temptation to step up in distance. “We’ve kept him at 1400m on the Lakeside and the soft track will not affect him,” Moroney said. “We’ve claimed with Jack Martin and from barrier nine he’s drawn to get a good run. Lakhoni (pictured) is in race seven, the Sheen Panel Service Handicap over 1400m with Patrick Moloney to ride and jumping from barrier 11. Lakhoni made ground in the straight at his last start when finishing fifth over 1200m at Caulfield and Moroney is pleased with the way the son of Dalakhani is holding his form. “I’m very happy with him and it looks a strong race for this level at midweek. I’ve always thought he’s up to winning at a good level and back to his own age I think he’s a winning chance,” Moroney said.